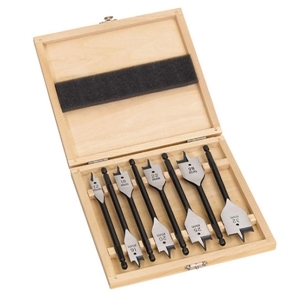 160 mm length 8pc Flat bit set (Ø 12 / 16 / 18 / 20 / 22 / 25 / 28 / 32 mm) in wooden box. Fast drilling of big diameters. Suitable for drilling in natural hard and softwood and chipboard. Ideal for door locks, morticing, electrical and plumbing work. 1⁄4" Hex shank reception (DIN E 6.3) for direct insertion into the power tool or for secure chuck grip. Ground centre point for accurate positioning and sharp wings for improved cutting performance.